Games To Play With Your Dollhouse - Some Fun Ideas Here! for kids are a wonderful toy that can provide lots of fun and entertainment for children. They are also educational and can support many aspects of your child’s development. 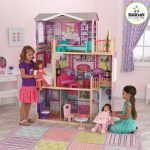 There is more than one way your child can play with their doll house as this toy is the perfect setting for a wide range of different games and activities. If you have an older child who is creative, then helping them to build their own dollhouse is a fantastic activity. Although this is an activity that can take time and a lot of patience, your child will have a great sense of pride at their achievement and appreciate their home-made house even more. It is also more likely that they will take good care of it in the future as they will not want their hard work to go to waste. Once they have completed the house, they can then build their own doll house furniture or simply buy the accessories with which they can furnish their little house. There are many DIY dollhouse kits available that vary in the ages and abilities they are suitable for. These also come in a variety of sizes and styles. You may prefer a simple one-room doll house kit or a kit to create a big house with a traditional style. 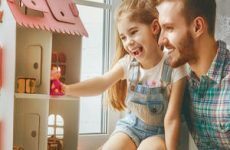 One of the simplest and most common ways that a child will play with their dollhouse is by recreating scenes that reflect their personal life experiences. They will allocate roles for each of their dolls and these often represent real people they know. For example, they may give their play house family the characters of their mom, their dad, their siblings and their selves to act out typical conversations and scenarios from their home life. Or, they will give an adult play figure the role of teacher and smaller play figures will become pupils in a classroom. Similarly, the games that children play with their dollhouse often reflect their future aspirations. They will give each of their dolls or play figures a role that represents how they envision their self in the future. This could be a doctor, a fireman, a CEO, a waitress, a builder or even the president of the United States. Adding furniture to a dollhouse is all part of the fun. It is a chance for your child to get creative and arrange the furniture in such a way that the little house is personalized to their taste. If they get bored of the way they have arranged the furniture, then they can simply rearrange it as and when they want to make the house suitable for any games they are playing. While some houses come with plenty of furniture, others have no furniture at all. However, it is possible to buy separate dollhouse furniture sets or additional pieces for all sizes of doll houses, from miniature to Barbie sized dollhouses. The more items of dollhouse furniture a child has for it, the more options they have when it comes to the interior design. 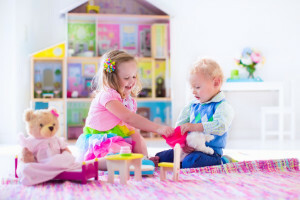 Although most dollhouses are designed to appear just like a smaller version of a real home, there is no reason why it must retain this function when children are playing ‘let’s pretend’. A mini house can become any setting they like to play their games. For example, they can pretend that the doll house is a hospital and use it to treat their sick dolls. Alternatively, they can play at offices and have their play figures working in each room. 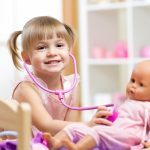 If they have toy animals, they can even transform their house into a veterinary hospital or a zoo with their play figures taking on the roles of veterinary nurses or zookeepers. There is no end to the possibilities when it comes to using their dollhouse as a different setting. A dollhouse is a good focal point for any fun, craft activities you and your child enjoy. One such example of this is creating extra items of décor for the house according to the seasons. 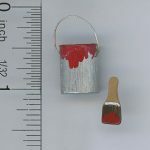 You can make special Christmas dollhouse accessories together to give it a festive touch or make flags and banners for occasions such as Thanksgiving or Independence Day. If your child would like extra characters for their little house, there are many ways you can make some simple play figures for them to use. 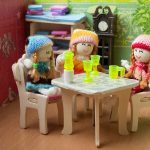 Felt dolls, cardboard cut outs, and peg dolls are all easy to make. While the interior of many dollhouses is often quite detailed, there is usually no garden. Adding a garden to the surrounds is easy and will allow them to create extra scenarios with their dolls that extend beyond the house. Decorating a large piece of card or MDF for the house to sit on will give the impression of a garden. You can then make extra accessories together, such as a sun shade, potted plants and a swing from bits and bobs you have around your home. These are just some of the ways that a child can play with their dollhouse. Realistically, there are endless possibilities and this will depend on the interests of the child. A doll house can inspire a child to use their creativity and imagination when playing and, for parents, this is a wonderful thing to witness. Click here to see some awesome dollhouses for girls & boys!